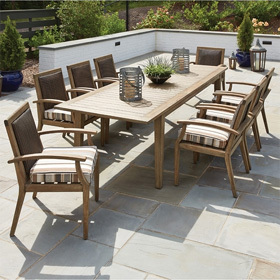 Get everything you need for your patio paradise with the Montecito Wicker Patio Set with Loveseat Bar by Woodard. This set includes a pair of lounge chairs and a love seat with plush cushions guaranteed to keep you comfortable all day long. As an added bonus, the back of the love seat doubles as a bar table perfect for enjoying refreshments in style. Three bar stools with padded seats provide you with a sophisticated elevated dining experience. The set is completed by four brunching tables that offer an additional place to set snacks. Woodard all weather woven furniture is constructed using cutting edge HDPE fibers, hand woven over a painted aluminum frame. With this combination of resilient, weather-resistant materials and Woodard's quality workmanship, our woven furniture will last for years. Love Seat Bar 67"W x 50"D x 40"H 150 lbs. Lounge Chair 41"W x 38"D x 26"H 75 lbs. Bar Stool 22"W x 24"D x 47"H 24 lbs. Table 18"W x 18"D x 20"H 15 lbs.